This one is not exactly new, but nevertheless pretty cool. Architecture mag freshome put together a short feature celebrating the design and architecture of some of the most striking architecture projects that resemble or are derived from the Hobbit holes of The shire. Check it out and enjoy! 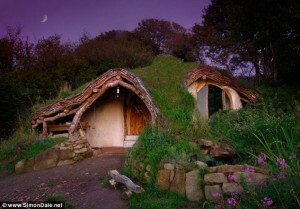 Simon Dale of Wales envisioned a sustainable woodland home in a hill on the countryside, which may be considered “cartoony” enough to match the small hobbit homes from the Lord of the Rings. The project is daring, highly practical and it only cost its owner £3,000 to build. A nice way to escape the hassle of monthly energy bills, wouldn’t you agree? If you enjoy the work we do here at TheOneRing.net, and would like to see your Tolkien community keep on growing and growing, please consider making a pledge. Time is fast running out to join the Tale of Honour — there’s only a day or so left on our Pledge Drive!